When ordering an ENCTDR100, what comes with it? 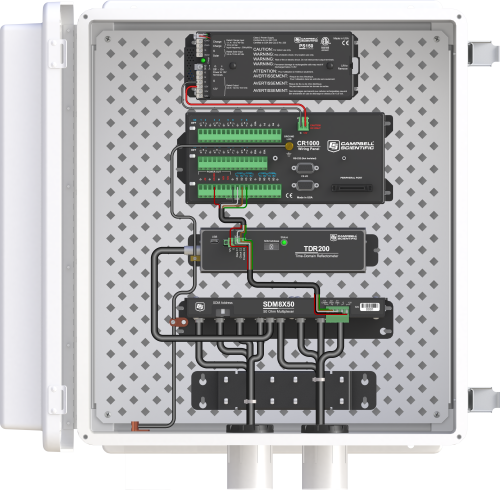 The ENCTDR100 (TDR System Enclosure) includes a coaxial cable, enclosure cable, and conduit ports that enter the enclosure at the back plate level to reduce coaxial cable bending stress on the TDR100 and/or SDMX50SP equipment BNC connectors. The ENCTDR100 has enough space for a battery/regulator, datalogger, TDR100, and one SDMX50SP. The ENCTDR100 ships with the items listed in the Ships With box on the right side of this page. When ordering a TDR100, what comes with it? The TDR100 ships with the items listed in the Ships With box on the right side of this page. In addition, consider purchasing the ENCTDR100 TDR System Enclosure. This enclosure ships with many items necessary for a TDR100 Data Acquisition System. See the Ships With box on the right side of this page. What factors affect the amount of desiccant needed in an enclosure? It may be advantageous to use more than one desiccant packet at a time inside an enclosure. Campbell Scientific recommends keeping an extra supply of desiccant on hand for as-needed replacement in the enclosure. When should the desiccant inside an enclosure be replaced? The desiccant should be replaced when the top colored dot on the humidity indicator card (pn 28878) turns pink; the humidity indicator card is included in the enclosure supply kit that is shipped with each enclosure. If the CS210, Enclosure Humidity Sensor, is used, replace the desiccant when the measured humidity exceeds 35%.